The Crowfoot Glacier, named for its three glacier toes that once formed a very visual representation of the black bird’s foot, has retreated so much since early explorers discovered and named it that it has actually lost an entire digit. Despite its lost toe, the Crowfoot Glacier viewpoint on the Icefield Parkway is still spectacular, especially for northbound travelers due to its position as the first of many up-close viewpoints along the drive. Opposite this spot is the Helen Lake trailhead. This popular hike is strenuous, but the reward is in the stunning mountain scenery, as the trail crosses a series of alpine meadows covered in summertime wildflowers as it climbs toward Helen Lake. The best views of the Crowfoot Glacier are found further up the trail, but only hikers willing to tackle the steep Helen Lake Headwall will have unobstructed views of the Wapta Icefield, which lies beyond the Continental Divide. Both the Crowfoot Glacier viewpoint and the Helen Lake Trailhead are found 22 miles (35 km) north of Lake Louise on the Icefield Parkway. The Helen Lake trail is 7.5 miles (12 km), and most hikers require four to five hours to complete the trek. Journey one way from Calgary to Jasper, stopping to enjoy the amazing natural scenery and great attractions in Jasper and Banff National Parks, during this 11-hour transfer and guided tour by coach. Photographers, outdoor lovers and casual sightseers alike will enjoy this opportunity to travel along the majestic Icefields Parkway that runs between the two cities, stopping at iconic locations like Lake Louise, Peyto Lake, Crowfoot Glacier and Athabasca Falls, among others. You’ll also take a ride on top the Columbia Glacier in the all-terrain Ice Explorer and take a break to purchase lunch. 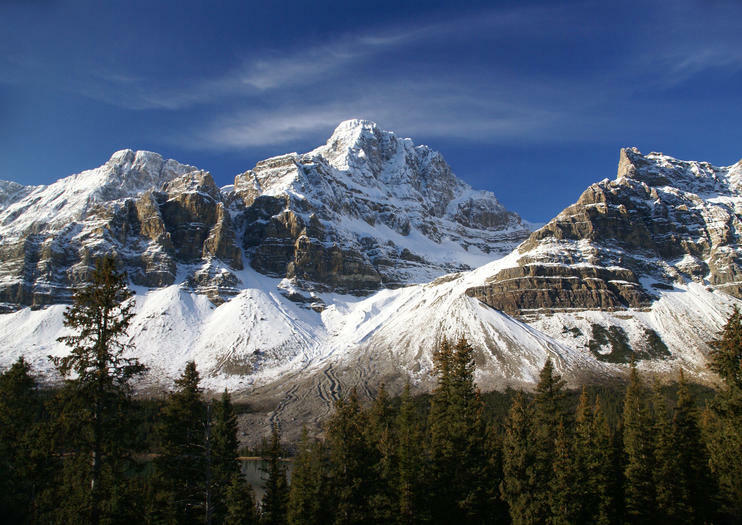 Explore the heart of the Rocky Mountains with a trip through Banff and Jasper National Parks! This 3 day tour through the Canadian Rockies will take you on one of the most scenic roads in the world, the Icefields Parkway! You'll discover amazing glacial lakes (including Lake Louise), snow-capped mountain peaks, pristine rivers, waterfalls, and wildlife everywhere you look. Moose tours are designed for 18 to 35 year olds, but we welcome all adventurous travellers that are 18+.Note: the Athabasca is the middle 3 days of the 8 day Caribou tour. Some of your fellow travellers will have started together in Vancouver before you join them, and some will be continuing back to Vancouver after you finish.